Yesterday Euan and I headed up to Stob Coire nan Lochan. We did Chimney Route VI/6 ***, It follows the main chimney line up the middle of summit buttress. This was the first time i had been to this coire and it will not be the last. 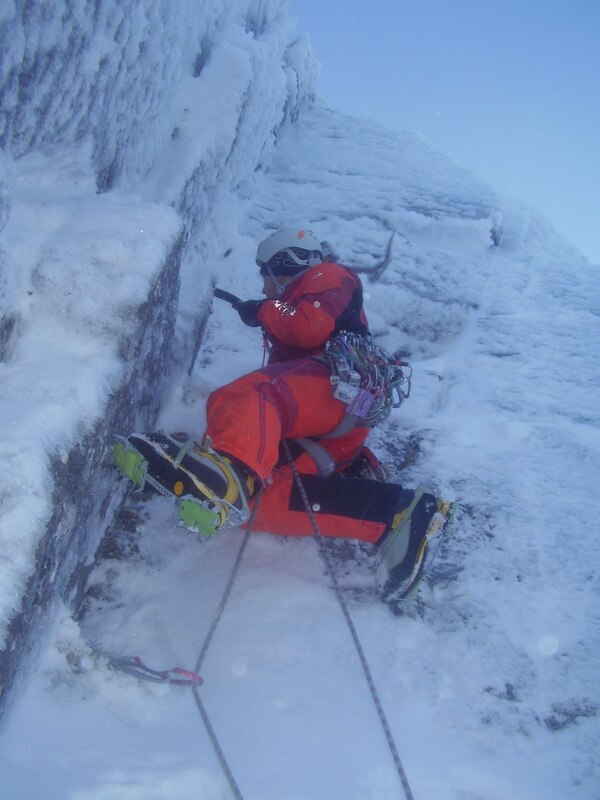 We intended on doing “Central Grooves” but it was not in good enough winter nic to justify a winter accent.So we opted for Chimney Route which had good ice build up at the bottom and the chimney was chocked full of snow ice, with good frozen turf and neve on the long middle pitch. The first and third pitches were sustained and steep, but very very enjoyable, and the second pitch had a technical 10m to start then eased off for 35m to the belay (more pics to follow). Yesterday Sarah (my sister) and I did a short day on the Mess of Pottage. We did a route called The Haston Line IV/4, even though it had quite a bit of build up it still had a few tricky mixed steps in the lower half of the route. James and my dad did Hidden Chimney Direct Start and they said it also was a little easier due to the build up but it was still a very enjoyable route. 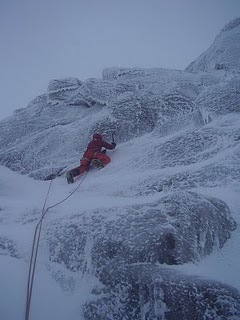 On Sunday Adam and I did two very good routes on Fiacaill Buttress. 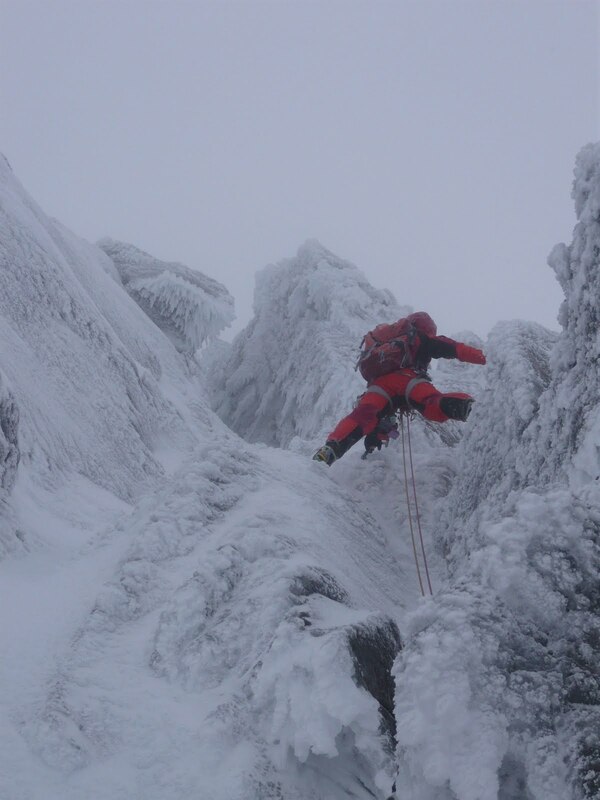 We did a IV/6, called Escapologist which had some good ice on the lower slab and a steep pitch near the top. Due to the good ice this made it hard to protect but easier to climb. We then did a second route called Straight to Jail, this is a seldom formed V/5 Ice groove which offered some thin but awesome climbing. It was good to make the most of the ice while it was there as it is not usually in such good condition. 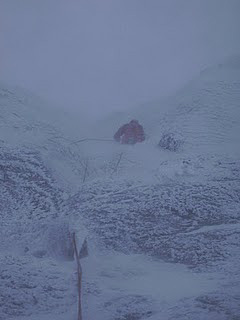 Today Adam and I headed into a very wind Sneachda. We headed for Aladdin’s buttress and did a route called The Paramedic VII/7. This was an awesome route with some good but thin ice on the first pitch which made it hard to protect, but Adam kept his head together on the thin sections and made it look easy. He ran pitch one and two together which made a good 55m pitch to the bottom of the top groove. 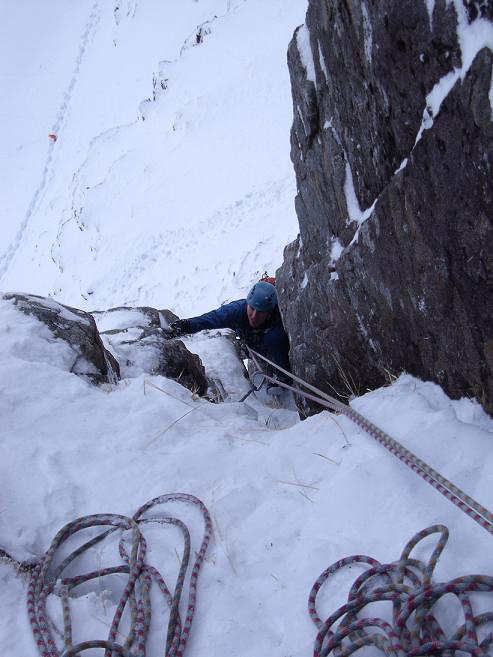 I led the last pitch which headed up a thin crack at the back of a steep groove with a capping roof at the top. It was hard to find gear as the groove was home to a lot of snow and ice but when the gear was found it was good. The roof was good fun and left you in an awesome position when turning it. It was a good day on a good route even though the wind was epic on the plateau and on the decent. Today James, my Dad and I had a good day in Sneachda. We did Broken Gully Left hand Start III/4 which had good ice coverage on the last pitch. We then came back down and did Fluted Buttress Direct IV/5 which was a really good route with some interesting climbing on the lower section in the chimney which James led. 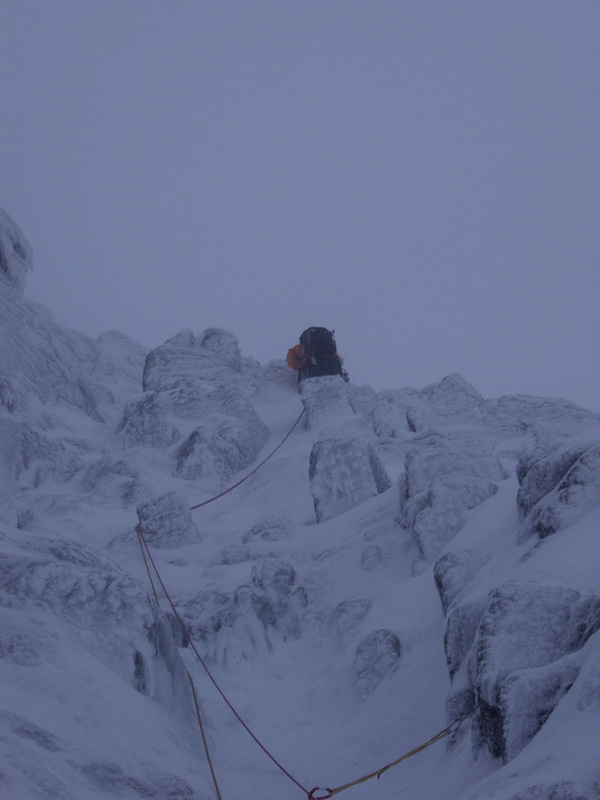 The second pitch had a few tricky mixed steps but where well protected and short lived. This route well deserves the three stars that it is given in the guide. Today Adam and I headed into Coire an Lochain to try some harder routes. 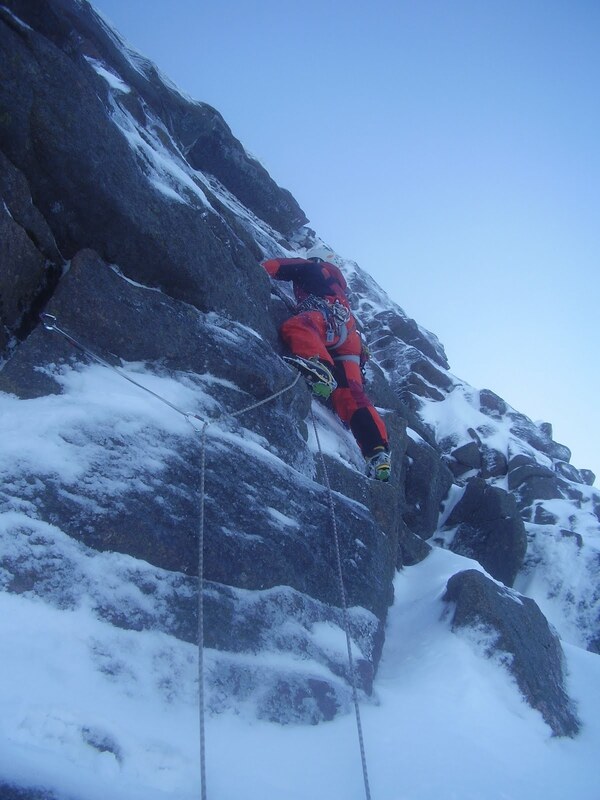 Unfortunetly due to heavy build up on the buttresses we were unable to tick anything hard and we settled for some fun climbing on No.2 buttress. We did a route called Astroturfer, III. 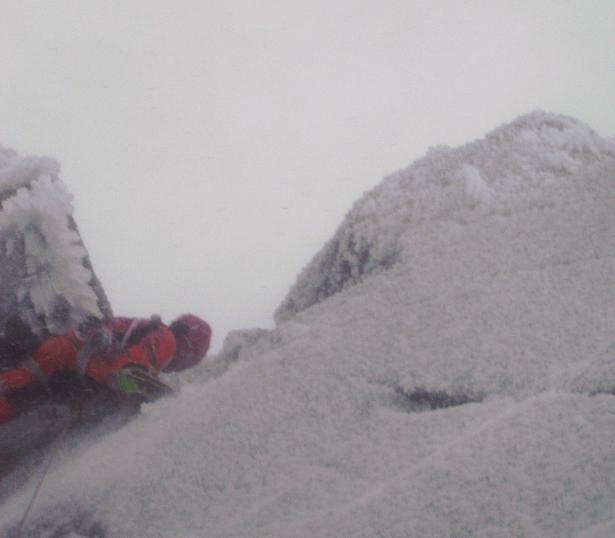 There was alot of ice on the route which made for speedy climbing. 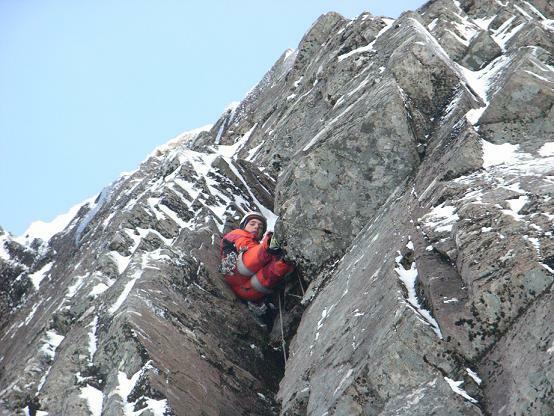 Yesterday James, Euan and I did Belhave V/6, on Fiacaill Buttress. It was a really good route with some fairly sustained climbing on the top corner pitch. Unfortunately it was raining on the walk in to the coire and it continued to soak us for the rest of the day. Most of the buttresses have been stripped by the warmer weather and rain but there is still some gully routes to climb and a few steeper routes if you don’t want to be picky. Hopefully the colder weather that is forecast will sort us out with some better conditions for later in the week. Today Adam and I fancied a bit of an easier day so we headed in to Sneachda and climbed ”Wachacha” VI/7 on the Mess Of Pottage buttress. It was an interesting route, very different to yesterday. 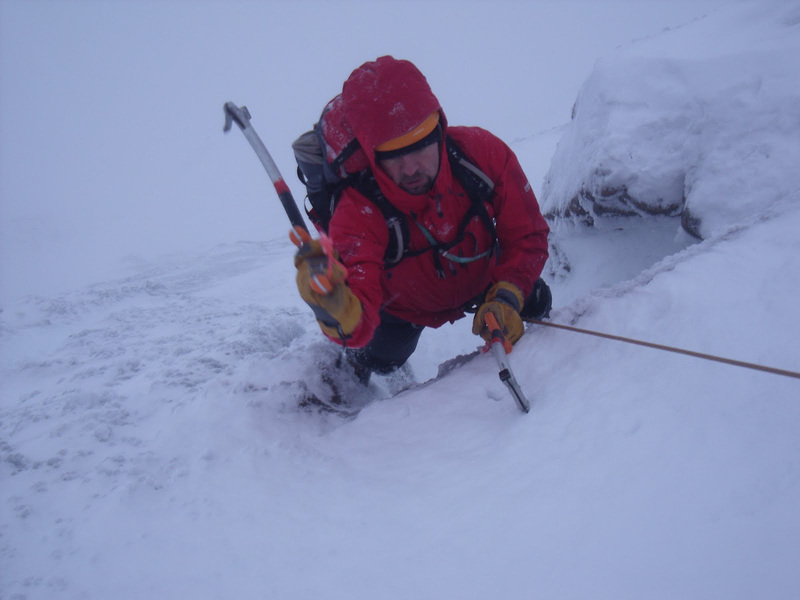 It consisted of a technical crack on the first pitch with some suspect gear because there was a lot of ice about. The second pitch had a bold slab traverse which lead into a steep crack. This was a good route and a fun couple of days. Yesterday Adam and I made the most of the amazing weather and good conditions, we headed up into Coire an Lochain. We did ”War and Peace” VII/8 on No.4 buttress. It was a very sustained route with a very bold and technical first pitch, and a super steep and pumpy second pitch with a hard corner to finish. We both enjoyed the route and as it was Adams first route of the season it was a good effort on his behalf. Out yet again today with James. 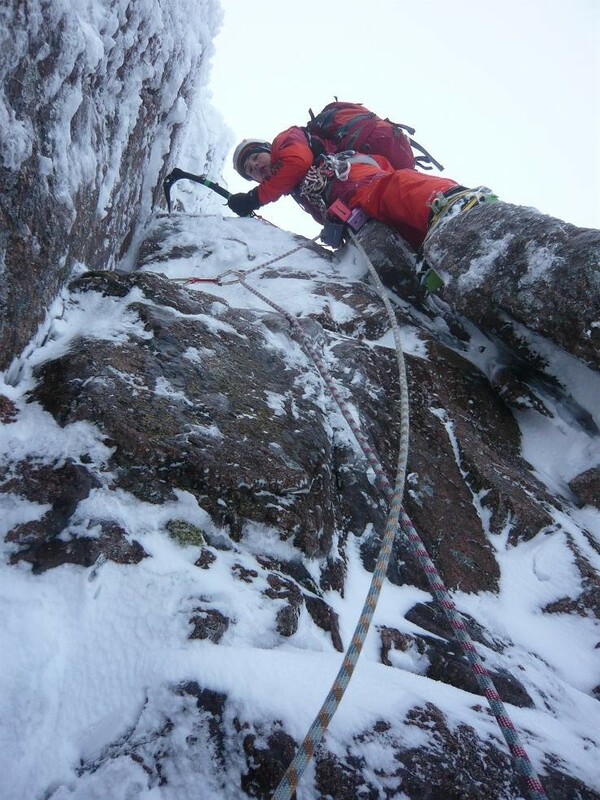 We went into Lochain and did central crack route, the route was good but the middle section was buried under lots of snow and the crack on the first pitch was chocked with verglass. I wanted to finish up the short route called ”The Crack” but when I got on it i soon realised that it was not a good idea, as it was full of either rotten or bullet hard ice which made climbing and protecting the route quite hard. As I was starting to think that it might not be a good idea to continue when I couldn’t get any gear in the lower section, gravity made the decision for me and I found myself back at the base of the route sitting in the deep powder. The route looked amazing so I will definitely be back for round two when there is less build up. A rest day tomorrow then back out on Thursday and Friday.